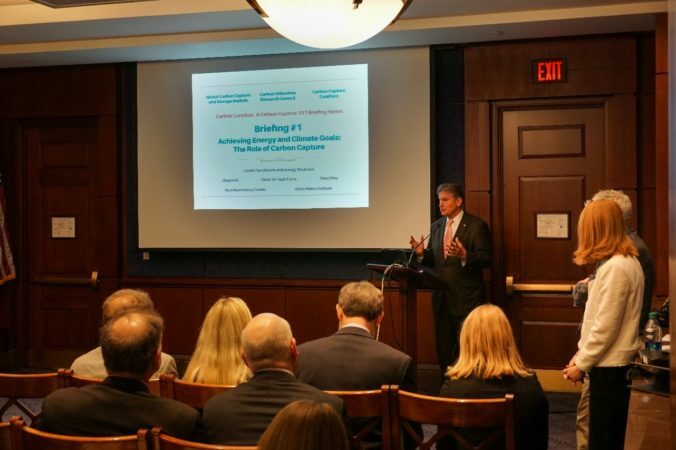 On Thursday, March 28 the Global CCS Institute, in partnership with the Carbon Utilization Research Council (CURC) and the Carbon Capture Coalition, hosted the first of many Carbon Lunches: A Carbon Capture 101 Briefing Series in the United States Congress. The inaugural Carbon Lunch featured high-level speakers from the Center for Climate and Energy Solutions (C2ES), the International Energy Agency (IEA), and the World Resources Institute (WRI), and attracted more than 100 attendees, including staffers, experts, and climate change advocates. Aimed at informing and educating US Congressional staff and lawmakers, as well as other stakeholders, on carbon capture and storage and the suite of technologies’ important role in reducing emissions and achieving climate goals, Carbon Lunches is a series of briefings that will run throughout the Spring and Summer. The first Carbon Lunch focused on an introduction to the series as well as carbon capture and storage, and how it fits in to the energy and climate policy framework. The briefing was opened by carbon capture champion Sen. Joe Manchin (D-WV) who is the ranking member of the U.S. Senate Committee on Energy and Natural Resources. He emphasized the importance of carbon capture on the road to decarbonization alongside other sources of clean energy. Rep. Marc Veasey (D-TX) had also agreed to serve as speaker but had to cancel at the last moment due to a personal matter. Bob Perciasepe, President, C2ES, delivered the keynote address highlighting carbon capture’s role as an opportunity catalyst for economic growth and job creation, as well as its versatile applications in industry, power, and transportation. The Institute’s own General Manager – Client Engagement, Jeff Erikson, presented an introduction to the basics of carbon capture and storage. Karl Hausker, Senior Fellow, WRI, analyzed carbon capture’s role in the latest Intergovernmental Panel on Climate Change Report on Global Warming of 1.5 Degrees; 3 of 4 pathways include significant amounts of CCS. Samantha McCulloch, Head of CCUS at the IEA, presented the International Energy Agency’s hot-off-the-press Global Energy & CO2 Report 2018. With CO2 emissions up by 1.7 per cent globally, the world is not on track to limit global warming. In addition, clean energy sources were unable to keep up, with 70 per cent of primary energy demand added in 2018 satisfied by fossil fuel additions. 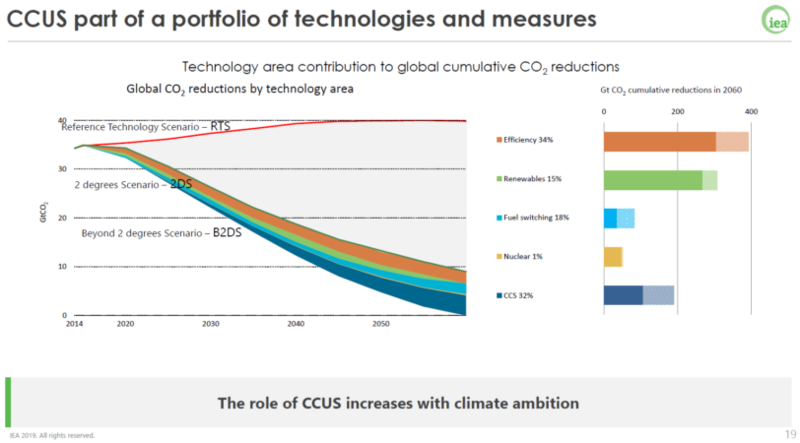 She also demonstrated that CCS is particularly needed to get across the finish line to zero emissions by 2060. The first Carbon Lunch attracted more than 100 attendees, the majority of which were congressional staff, and from many congressional offices that have not traditionally been supporters of CCS, signaling a growing interest in carbon capture as part of a national policy strategy to eliminating CO2 from all sectors. In an effort to demonstrate broad support for policy action on CCS deployment, Carbon Lunches is backed by a variety of stakeholders including C2ES, Third Way, Bipartisan Policy Center, ClearPath, the Great Plains Institute, Citizens for Responsible Energy Solutions and Clean Air Task Force. The room was reserved thanks to help from Sen. Shelley Moore Capito’s (R-WV) office. The next briefing will focus on CCS technologies and is scheduled for April 26 at 11:30am. Jason Grumet, President and Founder, Bipartisan Policy Center, will deliver the keynote address. Ron Munson, Principal, Cogentiv Solutions and former Institute employee, and Neva Espinoza, Director-Generation, Electric Power Research Institute, will provide introductions to CCS technologies.